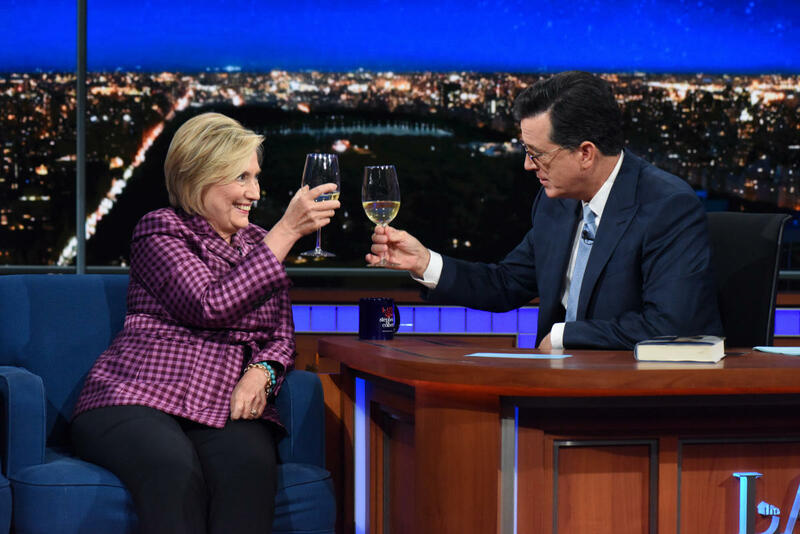 Hillary Clinton on CBS' "Late Show with Stephen Colbert" Sept. 19. 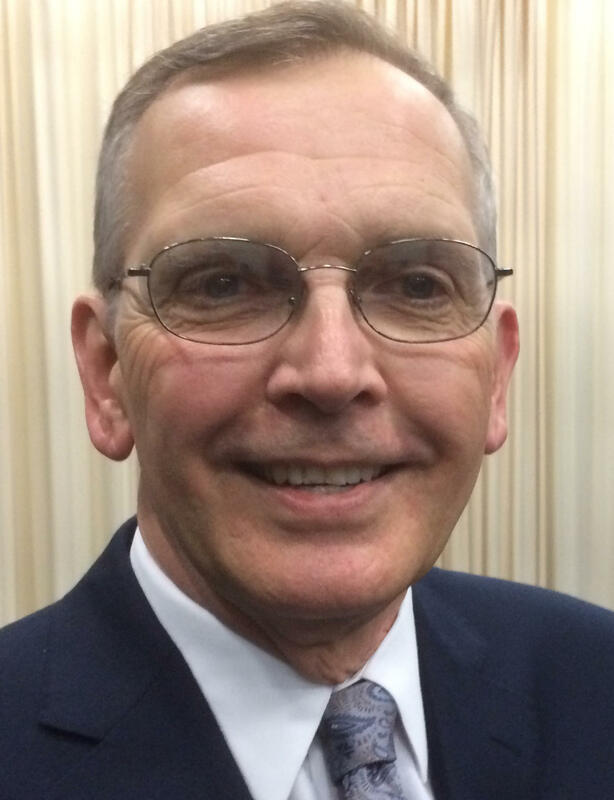 That was one of many questions Miami University students asked former NBC vice president Rick Ludwin during his annual presentation on the Oxford campus last week. Ludwin's topic this year was "How Late Night TV Made Fun Of Washington D.C. This Year," with clips from Colbert, Kimmell, O'Brien, Trevor Noah, Seth Meyers, Samatha Bee, "Saturday Night Live" and others. So why does Fallon do less political humor? "Jimmy is doing the amount he feels comfortable with. If he did more, it might come across as phony," said Ludwin, a 1970 alum who was NBC's executive over "The Tonight Show," "Saturday Night Live" Jay Leno, David Letterman, Johnny Carson, Fallon, Meyers, O'Brien and "Seinfeld." Kimmell has spoken out this year about health care and gun violence for personal reasons – his infant son needed heart surgery, and he wanted to talk about the Las Vegas mass shooting because he grew up there. 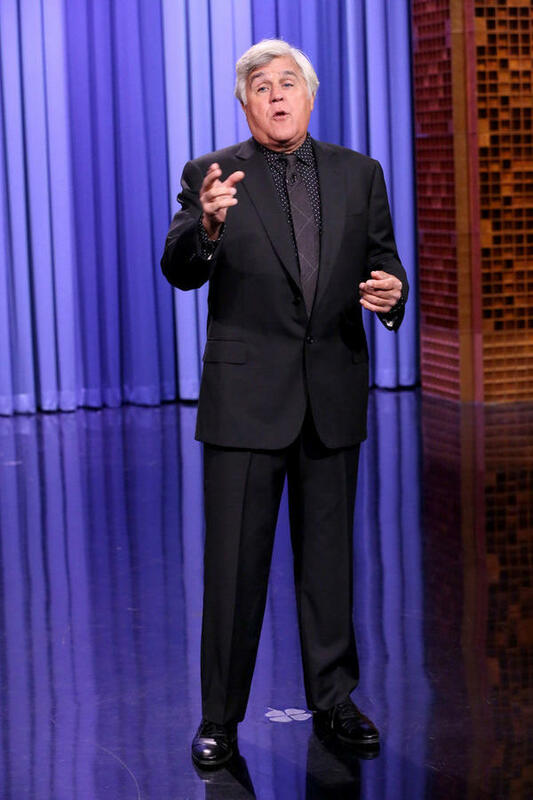 Jay Leno on "The Tonight Show with Jimmy Fallon" in 2015. Ludwin noted that not all late-night hosts in the past have told a lot of jokes about only the party in power. "Tonight Show" hosts Johnny Carson, considered the king of late-night, and Leno "made jokes about both political parties equally." POLITICAL HUMOR: "There's this seemingly insatiable appetite on the part of viewers for a comedic take on Donald Trump…. For late-night comedy writers, this is the gift that keeps on giving." RATINGS: Colbert shook up his production staff in January, before Trump's inaugural, to do more timely political humor. It has resulted in strong ratings. CBS' "Late Show" has "the largest total audience" (with viewers of all ages) – but Fallon's NBC "Tonight Show" wins the age 18-49 demographic advertisers want most. So both are doing well. 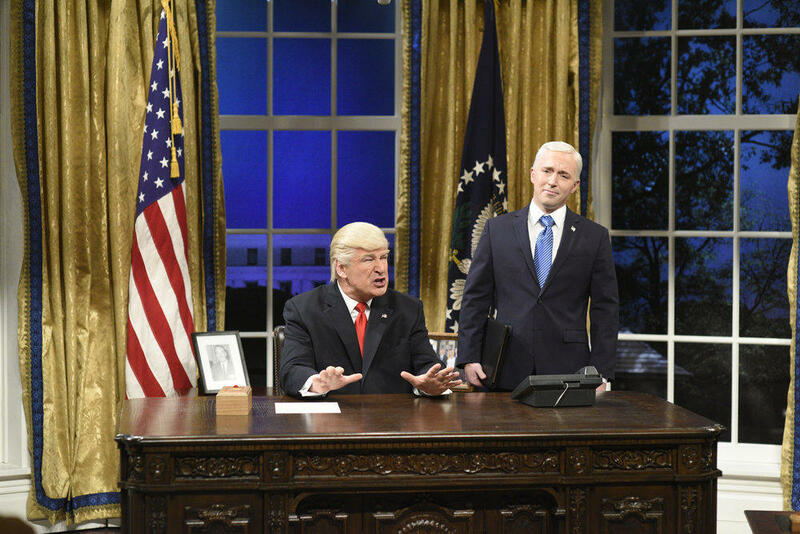 SNL: In the 2016-17 TV season, which included last fall's presidential campaign and Trump's first five months in the White House, " 'SNL' enjoyed its most-watched season in 23 years." "SNL" also won nine Emmy Awards, including honors for Alec Baldwin (for his Trump portrayal), Kate McKinnon (who did Hillary Clinton and Kellyanne Conway) and guest host Melissa McCarthy (who spoofed former White House spokesman Sean Spicer). Alec Baldwin as President Donald Trump and Beck Bennett as Vice President Mike Pence on "Saturday Night Live." BIGGEST CHANGE: What's the biggest change since Trump's election? "Normally you don't make fun of the president's family, the First Lady and his family," he says. But Trump's White House is different with his daughter and son-in-law serving as advisers, and his son Donald Jr. being investigated for actions during the campaign last year, he said. CROSSING THE LINE: Do some comedians and shows "cross the line" in making fun of politicians or the Trump administration? "Yes they do," Ludwin says. The bottom line: "It has to be funny. The audience has to laugh. You can't be mean-spirited. The audience will tell you very quickly if it's not funny." 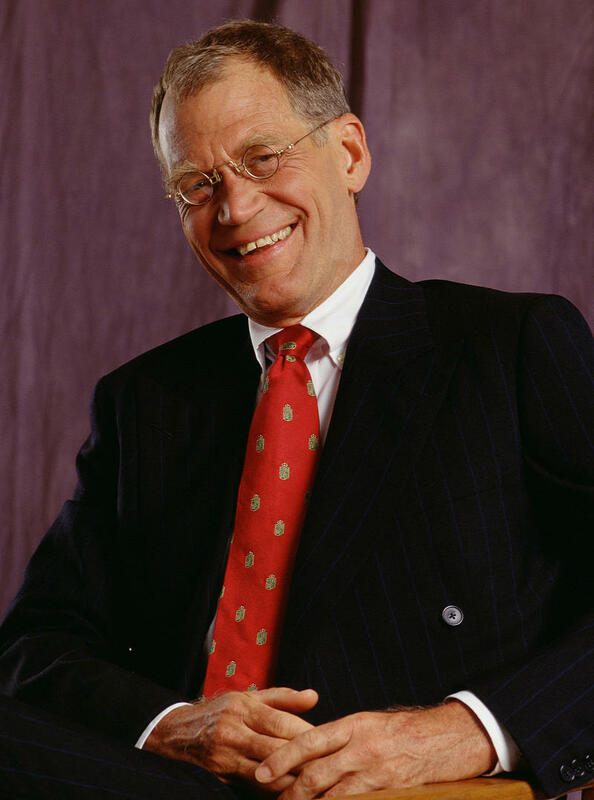 Former NBC executive Rick Ludwin, a 1970 Miami University graduate. REACTION: White House officials and others do complain when they think some jokes or sketches go too far. "You certainly hear from them when you make fun of them," says Ludwin, who used to monitor the "SNL" dress rehearsals 8-10 p.m. Saturday nights. Ludwin also noted that Trump has talked about trying to rescind TV networks' broadcast licenses -- even though individual stations, not networks, hold the licenses. "Thank goodness there is a First Amendment." PERFECT JOB: Ludwin worked 30 years as a NBC executive supervising late-night shows, specials (Golden Globes, etc) and "Seinfeld." "I loved it. It was the perfect job for me. To work with funny, creative people, and visit them in their offices -- you knew they were going to make you laugh. I loved every moment of my job." You’ll never watch Jimmy Fallon’s “Tonight Show” the same way after reading this column. I always learn a lot about TV when former NBC late-night programming executive Rick Ludwin returns to speak to students at Miami University, his alma mater. On Thursday night, he revealed NBC's camera tricks on Fallon’s top-rated “Tonight Show” to overcome limitations of cramped Studio 6B in New York’s Rockefeller Center – and a few other observations about Stephen Colbert and the changes in TV’s late-night landscape. David Letterman returns to NBC Friday in an interview with Tom Brokaw on "On Assignment," a limited spin-off series from "Dateline NBC" (10 p.m. Friday, Channel 5, NBC). The Letterman interview – which was pre-empted Sunday by the Orlando mass shooting coverage – is his first since leaving his CBS "Late Show" a year ago.